King of Bounce Tampa, LLC is a family owned and operated business for the last 6 years. We are licensed and insured and we provide the best variety and cleanest units on the market. We have very competitive pricing and we cover all of the Tampa Bay area. 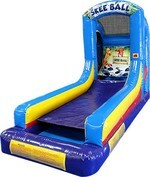 We offer Bounce Houses, Dunk Tanks, Moonwalks, Wet/Dry Slides and Interactives. 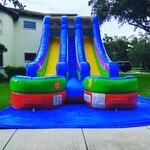 Whether it's a birthday or a holiday, King of Bounce Tampa, LLC can bring fun and entertainment to your party. We strive to make your party a worry/stress free experience so you can enjoy the party too! Drop-off times will be set up 24-48 hours before your party, we will call you and setup a 2 hour delivery window, In most cases the delivery will be at least 1 hour prior to your party start time. Pick-up time will be sometime after the 6 hour scheduled end time. Absolutely! Delivery, set up and pick up are included in our pricing. 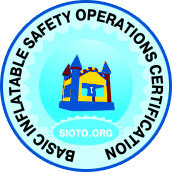 We will set up each bounce house and make sure that it's clean and in good working condition. Set up takes about 15-20 minutes and requires a 120V circuit with a minimum 15 amp breaker which is standard on most homes. Adult supervision required at all times. No shoes, eyeglasses, food, gum, candy, markers, crayons, pens, toys or drinks. No wrestling or fighting. No Silly String! We know that the weather here can be unpredictable and very harsh at times. We don't want to run the risk of injury to the children or damage to our equipment. So our policy is very simple. If you cancel for any reason before we deliver and setup, we will use your deposit towards a future event. (Hopefully you will try to reschedule and we will do our best to accommodate the request). However once we deliver and setup the product, no refund is available. There is also risk in high wind situations. Although it does not happen often, there are times when we will have to decline setup if we feel it would be unsafe to use the equipment. Winds in excess of 15 - 20 mph would prevent us from safely anchoring the unit. Deposits are required on a select units or multiple unit rentals. Deposits are nonrefundable. The deposit may be used on future rentals scheduled within 6 months. Click here for Online Payment Center We accept secure online payment through PayPal. Click the button below to visit the online payment center. 4-1 Colorful Combo Perfect for ages 3 to 8!! Minnie's Party Bouncer Try out our Brand New unit! Extreme Challenge Obstacle Try out our brand new Obstacle ! 18' Stephen's Double lane Water Slide Check out our great new Product. SKEE BALL Brand New Product for your next party!